“The expiring Marat is a light in the storm of Revolution. I don't know what kind of criticism one could have of this painting; perhaps it is just a depiction of a reality that he witnessed one hour after the event. This setting conveys a better understanding of the unfortunate message of the artist's idea. When I think of Marat, friend of the common man, I too disregard his enemies and don't concern myself with such details either. The truth that remains, and that of which I am in awe, is that this corpse will become the symbol of the Terror, that everything seems to have been put together by an infernal genius in order to excite pity and anger, and to give the plotters and criminals of the Revolution a context for their conspiracies. This popular journalist lives in a cave, his exhausted body in the service of the sans culottes in a poor lodging with cold walls, a frail man who's been assassinated in the bath where he ceaselessly works. He has just corrected his last writing. 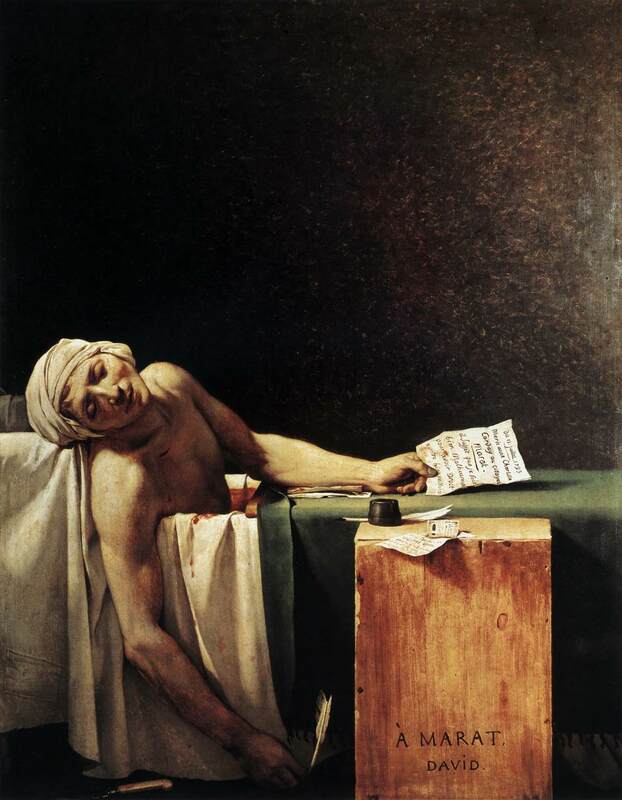 This sad vengeance of a vulnerable person by the hand of an elegant aristocrat, finally, this Marat who was a monster yesterday is today a martyr, a saint. That's what art could not have invented and what comes spontaneously from the palette of David; the political insanity of a woman....Seventeenth-century Dutch painting, which produced more accomplished works, never produced anything this powerful." Pierre-Joseph Prudhon, Du Principe de l’art et de sa destination sociale (Paris : Garnier Frères, 1865), pp. 120-1. Jörg Traeger, "Marat: La Religion Civile,“ in Régis Michel, ed. David contre David, 2 vols. (Paris: La Documentation française, 1993), p. 414. Charles Baudelaire, “The Museum of Classics at the Bazar Bonne-Nouvelle,” Art in Paris 1845-1862. Salons and Other Exhibitions, Jonathan Mayne, trans. and ed. (Oxford: Phaidon, 1965), 34-45.